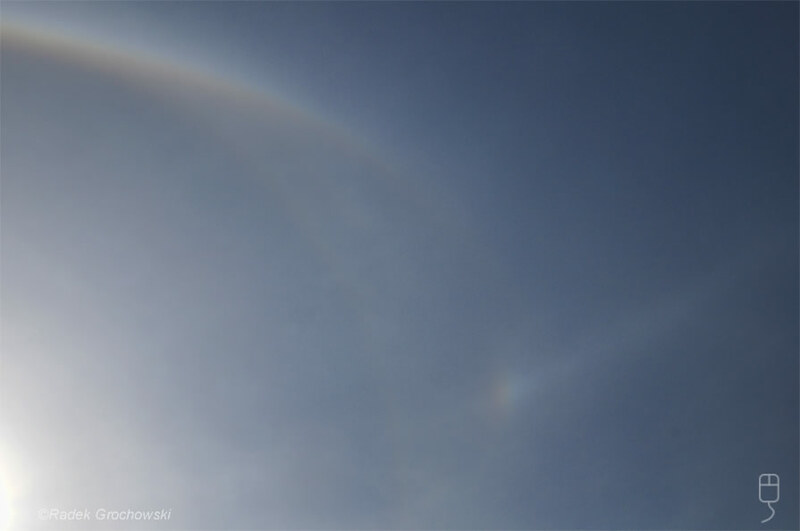 Radek Grochowski saw a long lasting complex halo display at Świdnica, Poland on March 25, 2013. Two images are below; but two hours after taking them he saw something exceptional. He saw a third halo arc improbably placed between the familiar 22 degree halo and circumscribed halo. My thanks to Marko Riikonen for instantly recognising what it was. A very rare halo arc from horizontal column crystals with pyramidal rather than flat ends. Pyramidal crystals mostly have aerodynamically rounded forms and therefore are not oriented. Rarely they take on plate orientations to give a variety of parhelia – plate arcs. Even more rarely they are oriented as horizontal columns. This took place over Radek’s Polish skies. Mouse over the image at left for an enhanced view. It highlights coloured halos and so the white parhelic circle has gone. While attempting ray tracing simulations and before doing this enhancement I struggled to modify the crystal shapes to eliminate other non-visible pyramidal column arcs. Then the enhancement revealed traces of them anyway! Radek’s image has more than one gem. The ray tracing at left for a 40° high sun used pyramidal crystals aligned as singly oriented columns. Randomly oriented columns produced the 22 degree halo and a few plate and Parry crystals completed the mix. The pyramidal ends are severely truncated and these crystals would easily take on precise horizontal alignments. The ray paths in square brackets use the face numbers here. Pyramidal arcs are named after the related odd radius halo that would be generated if the crystals were randomly oriented. All column arcs are contact arcs in that at some point they touch and are tangent to their related odd radius circular halo. It would have been delightful to also see the 9° column arc as final icing on the cake but it was likely melted by the sun's glare. My thanks to Marko Riikonen and Alec Jones for their input and for Radek Grochowski's sharp eyes and camera work. Images ©Radek Grochowski, shown with permission. The display two hours before the appearance of the pyramidal crystal column arcs. There was a full parhelic circle, 120° parhelia, 22° parhelia, Wegener arcs, circumscribed and 22° halos.